It may only be personal experience, but we have a large surplus in our bank account for the first time in 9 years. 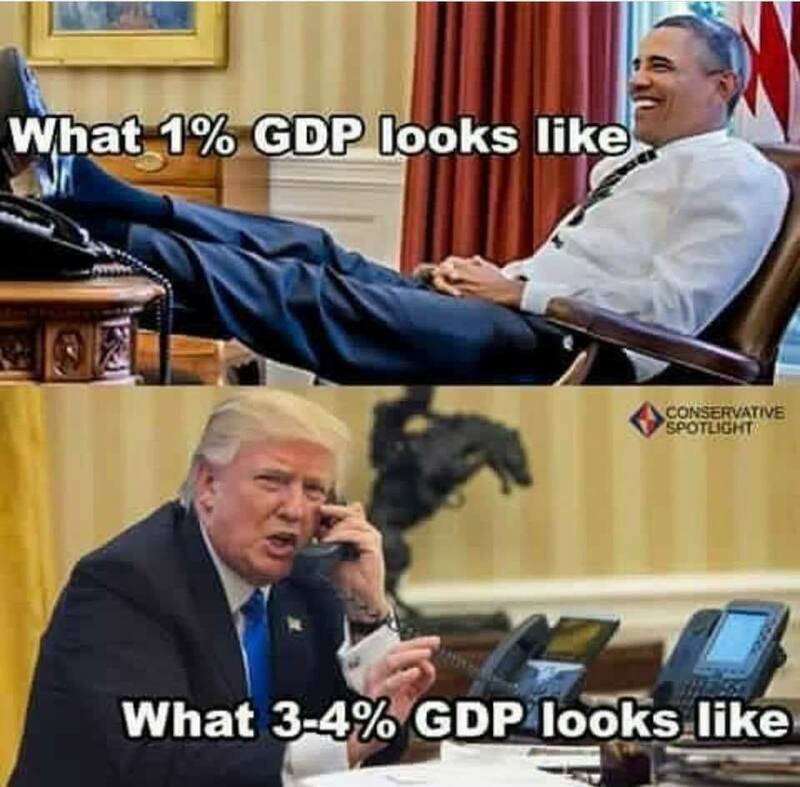 I cant help but be happy for the last year’s economic events and leadership.I’m sure Obama is fine person, but he was killing us. … and I think it is only going to get better. We certainly hope so, but we fear the agents of man’s ultimate enemy are conspiring to overthrow POTUS and all he is trying to do. It’ll be a hard row to hoe to reverse 8 yrs of increasingly socialist agendas. If the left starts winning, we wont get far and they’ll reverse the small amt of recovery we’ve seen. We have taken steps to take full advantage of the potentially short lived recovery. We sold out of the giant Atlanta mortgage, used all our savings to buy and renovate a 1870’s home in NW Mo., and we are already replacing the savings faster than we’d imagined. When it falls apart again we want to debt free. I do think it smart the way the GOP left personal tax cuts temporary. They learned from the ACA that once you give people something (even if they didn’t like it at first), you can’t take it away. It’ll be fun to watch Dems tell the working class how they want to not renew the tax cut and it’s b/c Dems care about them. I predict the Republicans come back in a couple of months with a new bill to make the tax cuts permanent (after taxpayers have felt the first wave of relief) and dare Democrats to vote against it.